Like any other joint, osteoarthritis of the thumb is typically self-managed by the patient for as long as they can manage it before pain and loss of mobility, and, especially grip strength and inability to sleep at night makes self-management difficult at best. At this time the patient will seek out their doctor who will likely refer them on to the orthopedist for more specialized help. As with other joints, many patients are often surprised that their doctor and orthopedist are making the same recommendations for treatment that they, the patient, was using to self manage: non-steroidal anti-inflammatory medications except in stronger doses or a better splint than the one the patient bought for themselves. Surgery or live with it, is there no other way? In this article, we will examine surgery and non-surgical options. The non-surgical options we will present here are likely new to you as they are not part of the well-accepted “conservative care,” option. In this article, we will talk about regenerative injection techniques that include Prolotherapy. In our clinics, we see and have seen many patients with thumb osteoarthritis. The reason that we see them is that these patients sought out an alternative to thumb surgery. When we discuss surgery, it is always best to listen to the surgeons and the challenges they are facing in providing joint replacement surgery. An April 2018 study from a team of Belgium doctors that appeared in the American Journal of Hand Surgery (1) questioned whether or not a thumb joint replacement surgery provides a good benefit for the patient. Here are the highlights of that study. The study begins with four female patients who have stage III osteoarthritis at the Trapeziometacarpal (the base of the thumb). The four female patients had significant loss of range of motion in their thumbs. This lead to a recommendation for TMC (Trapeziometacarpal) joint replacement surgery. So what happened after the surgery? How was the range of motion in the replaced thumbs? So after thumb replacement the thumb does not return to a more natural range of motion. This may not be an important factor for many people, especially people who have deformity from rheumatoid arthritis (see below), but it is certainly an important factor for people who rely on their hands for work or if they are an artisan. Tell a pianist or a carpenter that his/her thumbs won’t move that well after surgery. See how fast they look for an alternative to their thumb arthritis. To restore a more natural movement to the thumb joint, you have to examine and explore the repair of the thumb’s ligaments. Repairing the thumb ligaments is the main objective of Prolotherapy regenerative medicine injections. We are going to discuss this below. This according to researchers from Indiana University School of Medicine, Tufts University School of Medicine, University of Bristol, Bristol, and the Dutch university researchers who made this statement in their paper: “Yet more evidence that osteoarthritis is not a cartilage disease,” published in the British Medical Journal. Thumb arthritis often involves inflammation of the basal joint (the base of the thumb), which is the joint that allows the thumb to swivel and pivot, it is also called the thumb carpometacarpal (CMC) joint or trapeziometacarpal (TMC) joint (as mentioned above), because the trapezium bone joins the metacarpal bone of the thumb. The basal and metacarpophalangeal (MCP) (the knuckle joint of the thumb), are usually the first areas where the pain is experienced. The thumb ligament that joins the wrist to the base of the thumb is called the radial collateral ligament, the same name as the ligament inside the elbow. The thumb ligament that joins the base of the thumb (the first metacarpal) to the succeeding joint (proximal phalanx) is the collateral ligament. If the ligaments in these joints are not strengthened, arthritis will eventually occur or worsen. Ligament damage and injury in the thumb can create a cascade of arthritic effects. For example, the cartilage that cushions the joint begins to deteriorate and then swelling and pain develop as the bones rub against each other. The ligaments eventually weaken further as they try to overcompensate for the lack of cartilage. The synovial tissue that lines the joint capsules may also become inflamed, leading to fluid accumulation in the joint. Pain, swelling and decreased mobility are the results, as well as a recommendation for surgery. Much of the research and attention of surgery for thumb osteoarthritis centers around the removal of the trapezium bone at the base of the thumb. The surgery is called a trapeziectomy. The trapeziectomy can be performed with variations to the technique. First is the removal of the bone. Some procedures will include a ligament reconstruction to strengthen the compromised anatomy and filling the void left with a forearm tendon. For patients with thumb arthritis being recommended to surgery the term interpositional arthroplasty or commonly referred to as trapeziectomy with LRTI would likely be recommended as a surgical choice. In the treatment of basal joint arthritis of the thumb, recent studies suggest equal outcomes with regard to long-term pain, mobility, and strength, in patients undergoing either trapeziectomy alone or trapeziectomy with ligament reconstruction and tendon interposition (LRTI). A retrospective chart review of 5 surgeons at a single institution performing CMC (wrist joint) arthroplasties from November 2006 to November 2012. A total of 200 thumbs in 179 patients underwent simple trapeziectomy with or without LRTI and with or without Kirschner wire stabilization (wires instead of tendons to stabilize the void), or ligament reconstruction. Seventy hands had a postoperative complication. Ten of these complications were considered major, defined as requiring antibiotics, reoperation, or other aggressive interventions. Risk of total complications was significantly greater in patients undergoing either trapeziectomy with LRTI or ligament reconstruction in comparison with trapeziectomy with K-wire stabilization. These results suggest an advantage of simple trapeziectomy. Joint replacement can be considered in selected patients who require greater strength and range of motion, although it has been associated with a higher complications rate. Numerous surgical procedures have been described to treat trapeziometacarpal osteoarthritis, but no approach is currently considered superior. Good long-term outcomes have been reported with multiple procedures. No studies have been published comparing outcomes of the Arpe joint replacement with those of ligament reconstruction and tendon interposition (LRTI). Pain relief and functional improvement were similar between groups. Pinch strength and range of motion were superior in the joint replacement group. Metacarpophalangeal hyperextension appeared to be prevented in the joint replacement group but increased over the follow-up period in the ligament reconstruction group. However, the complication rate was higher in the joint replacement group. Conclusion: Joint replacement can be considered in selected patients who require greater strength and range of motion, although it has been associated with a higher complications rate. Trapeziectomy with or without ligament reconstruction is still considered the gold standard, but the challenges associated with treating its complications limit its indications. 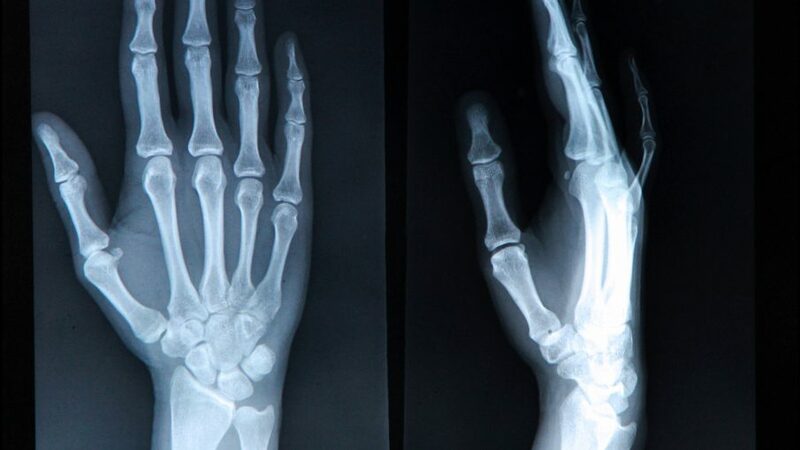 The demand for surgical treatment for Trapeziometacarpal osteoarthritis is growing and the patients are becoming younger, adding to the challenge. Surgery can only be proposed after failure of well-conducted conservative treatment and requires a complete X-ray assessment. In the early stages, conservative surgery measures can be used to stabilize the joint or realign it in cases of dysplasia, but in most cases, patients are seen with more advanced arthritis and joint replacement must be considered. The ideal arthroplasty technique has yet to be defined. Although many studies have been published on this topic, they do not help define the treatment indications. Medicine can sometimes be very amazing in its desire to do the most complicated and invasive things. Like performing two surgeries when one would have offered similar results with less trauma to the patient. Here is a situation where an alternative surgical option is given. It failed. Now the doctors had to go back to the original choice surgery to fix the alternative surgery. Total trapeziometacarpal joint replacement is increasingly being performed for the treatment of basal joint arthritis. However, complications such as instability or loosening are also frequent with TMC ball-and-socket joint replacement. Management of these complications lacks consensus. This study examined the results of 12 cases of failed TMC joint replacement that were treated by trapeziectomy with ligament reconstruction and tendon interposition (LRTI) arthroplasty. The study found the Trapeziectomy with LRTI after TMC joint replacement appears to be an attractive salvage procedure. Simply doctors had to go back to a surgery that could have been the first choice procedure, to repair the damage of an alternative choice surgery. Two surgeries when one would have offered similar results with less trauma to the patient. Making your thumb function better and move naturally without surgery is certainly an appealing option. Can this be realistically done? In the many patients that we have seen over the years, Prolotherapy injection treatments into the thumb have provided excellent results. Will this treatment work for everyone? The answer is no. Will it work for you? That is something that is discussed after a physical examination of the thumb and a discussion with the patient of the goals of their treatment. The goal of the Prolotherapy treatment is to bring stability to the thumb. Degenerative wear and tear arthritis occurs because of hypermobility/loose ligaments. In other words, the bones of your thumbs are moving around too much. This hypermobility is causing thumb joint erosion due to unnatural wear patterns in the joint. To compensate and hold your thumb together as best as possible, your body starts to grow bone (bone spurs) in the joint. Prolotherapy injections would be best given in the earlier stages of the disease before bone spur formation became a problem. The objective of the study was to determine the clinical benefit of dextrose prolotherapy (injection of growth factors or growth factor stimulators) in osteoarthritic finger joints. grade 1 osteophyte plus grade 1 joint narrowing. and trapeziometacarpal (thumb CMC) joints were eligible. Thirteen patients (with seventy-four symptomatic osteoarthitic joints) received active treatment, and fourteen patients (with seventy-six symptomatic osteoarthritic joints) served as controls. 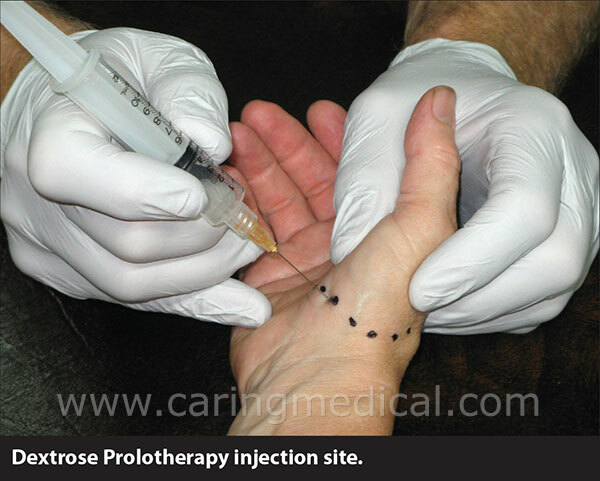 Considered a conservative treatment in comparison to surgery, Prolotherapy is a simple procedure, in which solutions of dextrose are injected into the afflicted area. Sessions occur over a period of time. The number of injections administered depends on the individual’s progress or failure to progress. A series of injections over three to six months was shown to reduce pain, improve function, and, thereby, improve the quality of life for the patients in this study. Patients typically need three to six treatments to achieve the best outcome, scheduled approximately four weeks apart. The procedure takes a few minutes. A patient could expect to receive 10-15 injections per session for basal thumb arthritis. Patients usually report a mild discomfort in the injected area that may last 24-48 hours after treatment. Normal activities can be resumed as soon as 24 hours. Prolotherapy enables TMC joint arthritis sufferers to avoid surgery and its possible adverse effects. The substantial advantages and minimal drawbacks (e.g., aversion to needles) as well as the reduced risks and increased rewards of Prolotherapy over conventional treatments suggest that this option for the second most common joint arthritis—that of the thumb—should be considered by doctors and patients. Also presented in the Journal of Prolotherapy, (10) our research and clinical team was documented a clinical case of a 57-year-old white female afflicted with rheumatoid arthritis received treatment for a 35-degree interphalangeal (IP) thumb joint deviation. The thumb deviation clinically described as a boutonniere deformity was treated with a combination of Prolotherapy and splinting. She wore a custom three-point splint for six weeks and received three separate Prolotherapy treatments within that six-week period. After treatment, the deviation decreased from 35 degrees to 10 degrees, and her thumb pain decreased from 7 to 1 on a pain scale of 10 as the highest level. Many people who are exploring non-surgical options to their thumb osteoarthritis may have come upon research surrounding the use of Platelet Rich Plasma (PRP). The preparation of therapeutic doses of growth factors consists of an autologous blood collection (blood from the patient), plasma separation (blood is centrifuged), and application of the plasma rich in growth factors (injecting the plasma into the area.) In other words, PRP is done just like any other Prolotherapy treatment, except the solution used for injection is plasma enriched with growth factors from your own blood. We are going to explore the research on PRP first and then discuss the combined use of PRP and Prolotherapy. This research centered on the trapeziometacarpal joint and carpometacarpal joint of the thumb. Group B patients (17 patients) received 2 ultrasound-guided intra-articular methylprednisolone and lidocaine injections at a 2-week interval. When a patient presents a more advanced case of osteoarthritis we may suggest a more aggressive treatment to include the PRP preparation. Why? The PRP has been shown in many studies, including the one we just cited to be more effective in cartilage degeneration. Moreso even than the simple dextrose Prolotherapy injections. In our clinics, based on over 25 years experience in treating patients with thumb osteoarthritis, we have found that injecting PRP to attack the cartilage breakdown and injecting Prolotherapy to tackle the instability of the joint by addressing and strengthen weaken ligaments provide the patients with superior results. In the right patient, PRP and Prolotherapy as a combined treatment would be favored. Another more aggressive treatment we may employ is Stem Cell Prolotherapy. This combined treatment presents the same clinical benefits as PRP PRolotherapy except we are using, bone marrow aspirate concentration or bone marrow-derived stem cells. Stem cell therapy in an injection of your own harvested stem cells. Stem cell therapy is typically utilized when we need to “patch” holes in cartilage and stimulate bone. We explore this option in patients when there is more advanced osteoarthritis and a recommendation to a joint replacement has been made or suggested. Our published research in the journal Clinical Medicine Insights. Arthritis and musculoskeletal disorders (12) demonstrates and documents clinical results in patients receiving bone marrow-derived stem cells and dextrose Prolotherapy. 10 Hauser R, Ostergaard S,Santilli S. Stabilization of Rheumatoid Thumb Interphalangeal Joint Boutonniere Deformity and Severe Subluxation with Splinting and Prolotherapy: A Case Report. Journal of Prolotherapy. 2012;4:e849-e854. Partial rotator cuff tear Do you really need a surgery? Shoulder impingement syndrome – Surgeons tell patients say no to surgery – What are your options?